Here it is; the Roger Moore era of James Bond films. And while it’s not every bodies favourite run of films, at least we start on a high with the awesome, action packed and original Bond film that is Live and Let Die. Roger Moore plays Bond in a different way to Connery and Lazenby; whereas they played him as more ruthless, Moore plays Bond with more charm, and a reluctance to kill. The endless witticisms and raised eyebrows might get more tiresome in the later Moore films, in Live and Let Die it is somewhat original and it’s not overdone like it was in the later films. But whatever your opinion on Roger Moore’s Bond he is defiantly memorable. The plot of LALD is, on the face, pretty simple. The President of fictional island Son Monique, Dr Kananga who is played by the great Yaphet Kotto, is somehow involved with a Harlem drug baron called Mr Big. Mr Big is revealed to be Dr Kananga in disguise, and that he is planning to distribute heroin through the fake dealer Mr Big, for free to drive other drug dealers out of business. Kananga’s island of San Monique is home to not only heroin farms but also to strange occult going on’s. The stranger occult parts of the film, such as the seemingly immortal Baron Samedi, might be a turn off for some. I like it though, and it’s not too heavy handed, it’s just the right amount of weirdness to be original, but without taking away from what Bond is about. The action in LALD is truly spectacular with the boat chase through the New Orleans bayous being one of the best action sequences in Bond history. The scene involving the crocodile farm is also another brilliant highlight. The performances in LALD are likely to divide opinion. Like, I said before, Roger Moore won’t be everybodies cup of tea, but I like him. Yaphet Kotto is the same. While I loved his performance as crazy, occult loving island diplomat Dr Kananga, not everyone did. The Bond girls in LALD are a mixed bag; Solitaire played well by Jane Seymour, is perfectly alright as a Bond girl. She is Kananga’s tarot card reader, and because of this she is more interesting than many Bond girls. Her performance is better than many others as well but she still falls into the old Bond girl stereotype. She’s beautiful, she falls for Bond, and subsequently becomes a damsel in distress. She’s a stereotypical Bond girl but at least she does it well. Another Bond girl in the film is traitorous CIA Rosie Carver. She’s important as she’s the first black bond girl, and this being 1973, that was a risky move for such a big franchise. This doesn’t mean she’s a good character though; Rosie Carver is not only killed, she’s a traitor, she’s ditzy, and she’s always screaming. She is an annoying character, and I only wish the first black Bond girl could have been in a more dignified role. Why not make an important character like Solitaire black? That was apparently writer Tom Mankiewicz first idea for the character but it was shot down by producers Broccoli and Saltzman. Many peoples problem with the film is the portrayal of the black characters. Nearly all of the black characters are villains or crazy cultists and all of them are beaten. But I agree with writer Tom Mankiewicz when he says that the black characters aren’t defeated because they are black, but rather they are beaten because they are villains in a Bond film, of course they are going to lose! There are also enough good black characters to offset the occasional, accidental racist tone. The criticisms that this is just a blaxploitation film starring Bond are somewhat unfair as well as Bond’s adventure into Harlem, while it is slightly racist, its racist to both white and black people and is all undertaken with a sense of fun and never with the intent to be offensive or hurtful. The Bottom Line: LALD is a fun, original Bond film with some of the best action in the series. 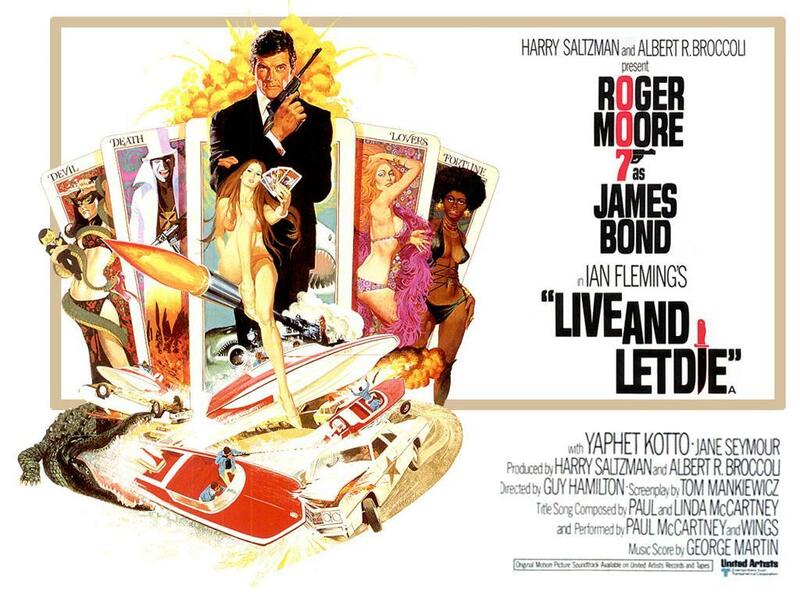 With a great performance by Roger Moore and a brilliant turn by Yaphet Kotto as a villain with the some of the best henchmen ever, and perhaps the best Bond song of all time, Live and Let Die is one of my favourite Bond films.